A Bride On A Budget received some of these items for review. Additional items and all thoughts and opinions belong to ABOAB. It's almost summer, which means that there's a chance your wedding weather is going to be a bit warmer than if you got married a few months ago (and warmer than it will be in a few months). Summer weddings mean you need to take a little more into consideration when planning, like if your venue has a working air conditioning unit. There's also a good chance that your guests who want a quiet place to talk will step outside into the sun and heat. You don't want to send them home burnt, so you should definitely watch out for them ... and set up a wedding sunscreen bar. Put the filler in the basket. Arrange the sunscreens in the basket. 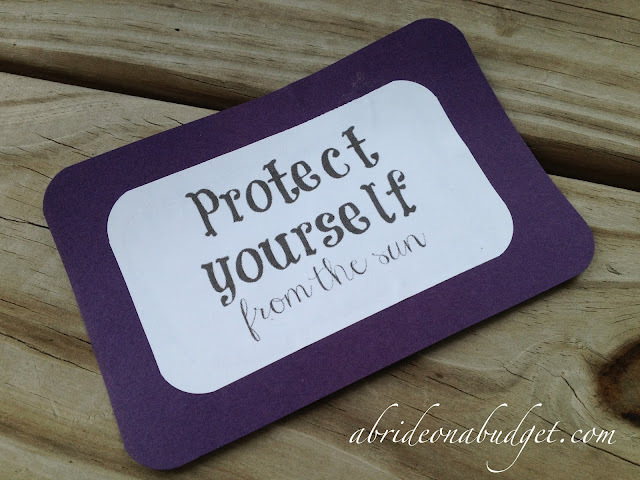 Print the words "protect yourself from the sun" on a piece of white card stock. Using a paper trimmer, cut the words out. Then, use the corner rounder to round the corners. Using the paper trimmer, cut a colored piece of card stock larger than the white piece. Use the corner rounder to round its corners. Glue the white paper to the colored one. Stick it in the basket and place the sunscreen bar somewhere your guests can find it. We put ours next to the flip flop basket. This was actually my dad's pre-wedding creation and I think he did a great job. We had a couple baskets to choose from when we were making it. We found a cute purple wicker basket, but it was too deep for the sunscreens. A few of the sunscreen we used -- like the Coppertone ClearlySheer Beach & Pool Mini-Spray -- are short, so they just fell and got lost in the basket. And if everything falls and rolls around in the bottom, guests who walk by would just see an empty basket and not use what you had set out for them. Then, we thought about using a larger basket, and my dad suggested cutting round holes in Styrofoam, sticking the sunscreen bottles in the holes, and covering it. That would have worked for the initial presentation, but you would need to rely on your guests to use the sunscreen, then stick it back in the appropriate hidden hole. Instead, we anticipated that our guests would just lay it on top and this pretty presentation would be ruined. So instead, we decided on a small basket and filled it with leftover Easter grass. The grass was really forgiving. We had six bottles total, all of various SPF's and types. Usually, when I'm spending the afternoon at the beach, I tend to purchase lotion. I put it on before we run out the door, and I'm protected at the beach. But for weddings, it doesn't exactly work that way. You have guests in gowns and suits, previously sprayed with perfumes or lathered with body lotion. Most women's faces are adorned with makeup. The last thing they want to do is ruin that with a suntan lotion. So sprays are great. Guests can just close their eyes, spray it on clear, and enjoy the outside. At the end of the night, we were left with only one little mini spray. Our guests had taken the rest home with them (which meant a few guests left with an additional favor, so they were overjoyed since most of our guests were spending the days after our wedding at the beach). I actually went out with some remaining guests a few days later and everyone was using the Coppertone Sport spray on a walk downtown. It was nice to see that our wedding sunscreen bar wasn't just decoration, but it was something that guests actually used the day of our wedding -- and after. 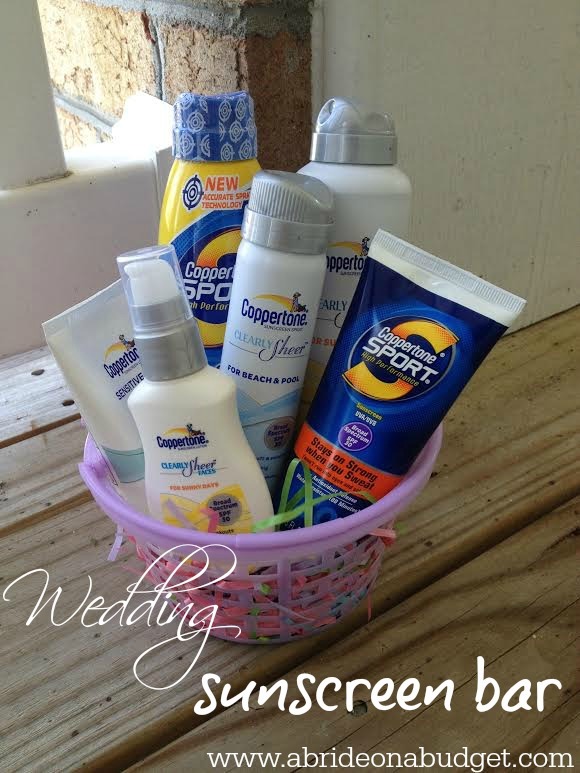 BRIDAL BABBLE: Is this DIY wedding sunscreen bar something you would do at your summer wedding? We had a summer wedding but it was all held indoors. However, we had out-of-town guests stay for several days. It might have been nice to have a sunscreen bar for them to enjoy spending time outside the rest of the weekend. I really like spray-on sunscreen. I need to get some more. I don't think they had the locking setup last time I bought some. Cool! Way to treat your guests right! Even though it's your day you do need to keep their needs in mind. Great idea! Great idea! I love practical! We were not outside at our wedding in August several years ago, but I do remember an outdoor ceremony I attended that I wish it had sunscreen. This is such a great idea. I bet everyone who forgot to put on sunscreen will be super thankful. That's something I wouldn't have thought of. I've been to a number of outside weddings and sure could have used sunscreen at some point! I've been into a beach wedding before and I wish I have read your post before that day! Nice post, by the way!